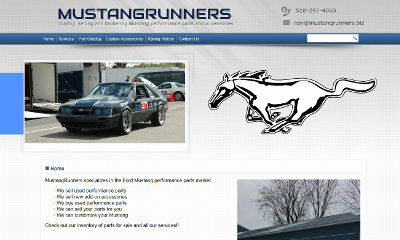 Ron, an owner of Mustang Runners, contacted us about getting a website created. He wanted to have a website to allow them to post performance parts for Mustangs on their website. Ron noted that they did not want a full-scale eCommerce site right now – but just a site that allowed them to have a catalog of their parts. We started on Ron’s website and worked closely with him to complete the website in a quick manner. He had a few updates as we went along – and we completed a website to his liking. Later on, Ron may add on the ability to have a shopping cart and eCommerce capabilities on the site. We appreciate the business from Ron! The Mustang Runners website is at mustangrunners.biz.